Victorian Umbrella Handle, late 1800's. 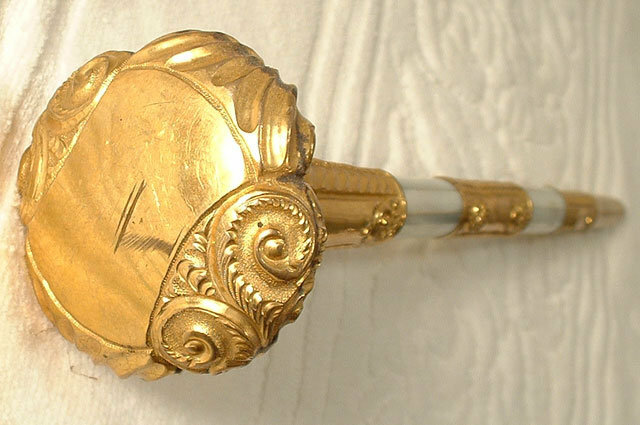 DETAILS: The handle is gold filled with ornate curved floral scroll patterns, center of handle is mother of pearl. CONDITION: Good, there are no cracks or chips on mother of pearl; gold has some very small dents, nice age patina. MEASUREMENTS: Handle measures 30 cm (11 &frac34; inches) long. For further details (pictures) please visit our website. Items Similar To "Antique Umbrella Gold Mother of Pearl Handle, 19th century"